Would You Do $11,500 For This Rare 1989 BMW 325iX Touring? Coming across today's Nice Price or Crack Pipe BMW for sale in the U.S. is like finding Sasquatch, the Loch Ness Monster, and a contrite Kanye West all playing tiddlywinks together in your bathroom. Unicornish as it may be, is its price also a rare sight? Have you ever seen the TV show Les Revenants? It's about a bunch of dead French people who come back to life by a reservoir (yay, French word!) full of corpse animals. A lot of folks here in the U.S. long for the day that the French auto industry will return from the seemingly dead to our shores, but until that happens, Francophiles will just have to make do with existing rides already here, like yesterday's 1989 Peugeot 405 DL. That's not too bad, and neither was that car's sub-two grand price tag, at least according to the 88% of you who gave it a thumbs up. That Pug represents a rare European import, albeit one that was intended for this market and met all U.S. safety and emissions requirements straight from the factory. If that feels too much to you like being under the thumb of The Man, then perhaps you'll be more interested in today's candidate, a grey market imported 1989 BMW 325iX Touring never intended to touch tire here. Whoa, did you just get a piss shiver just reading that? I know DeMuro was looking for one of these in Europe, but could not find one that met his exacting needs. Fun fact: Despite what you might think, Seattle - where this car presently calls home - is not in Europe. That may be the reason Doug missed this one. Still, it could have a full ashtray, bad karma, or other deal-killing aspect, plus he's buying a Datsun so there you go. That leaves this one for the rest of us, and I am sure that none of us is quite so discriminating. 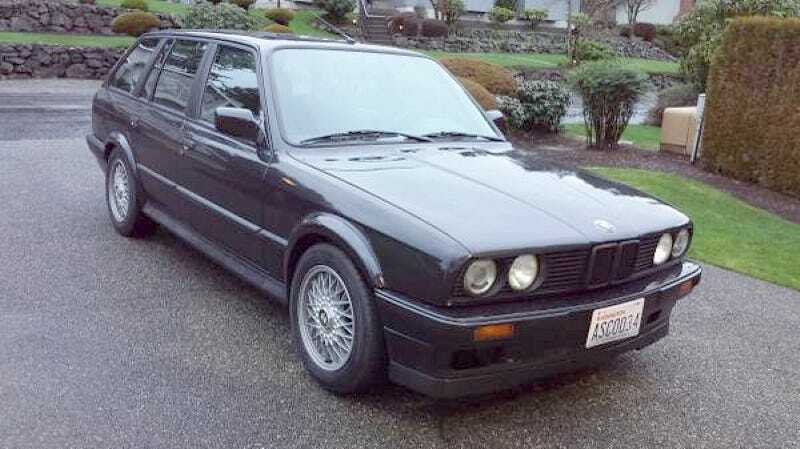 The E30 3-series has over the years gained a reputation for lust-worthiness that borders on the mythic. For rare-over-there editions of the marque, that passion can reach manic proportions. Let me just tick off this car's features and see if can control your ardor. This is a six-cylinder, 5-speed, all-wheel drive longroof of modest proportions from a company that is considered one of the automotive enthusiasts' top choices for both go and show. Topping that all off, its a car that was never intended to sell here, but for which parts are still reasonably able to be procured. Getting down to the nitty gritty, this 103,000 (miles? kilometers?) iX runs a 2.5-litre, 169-bhp edition of the M20 straight six, and behind that should be a Getrag 260 five cog box. The all-wheel drive system, which only adds about 150-pounds to the car, makes this more than just a fair-weather friend too. Other cool features are cloth seats that will keep you warm in the winter and cool in the summer, 15-inch basketweave wheels, and an M-tech steering wheel. Remarkably, all of these bits - along with the prone to cracking dash - look to be in most excellent shape. Yeah, the seats could stand a cleaning, but then, whose couldn't? Everything's not all strudels and poodles with this car. There is the issue of rust rearing its flaky red head in a couple of places. It's not like the floorpans have gone all Fred Flintstone or anything, but it does look like some POR-15 would be in order before things get really out of hand. Then there's the issue with the title. The ad says that the car was imported legally and presently has a clean Washington State title. That's more encouraging than, say a Florida title, and it is more than 25 years old so perhaps it's safe from the Fed's cube-o-matic. Okay, we've already established that you most likely want this car, now let's see if you want to like its price as well. The seller is asking $11,500 and requests serious buyers only. That leaves me out because I am a clown, but perhaps one of you could successfully negotiate the purchase of the car without asking the seller to pull my finger. Should someone be able to meet that standard, do you think they would be getting a deal at that $11,500 price? Is this rare AWD BMW A-OK for that much? Or, is that price too much for this Touring? H/T to heeltoes for the hookup!